In these piercingly lovely and endlessly surprising stories by one of the most acclaimed current practitioners of the art of fiction, many things happen: there are betrayals and reconciliations, love affairs consummated and mourned. But the true events in The Moons Of Jupiter are the ways in which the characters are transformed over time, coming to view their past selves with an anger, regret, and infinite compassion that communicate themselves to us with electrifying force. rcingly lovely and endlessly surprising stories by one of the most acclaimed current practitioners of the art of fiction, many things happen: there are betrayals and reconciliations, love affairs consummated and mourned. 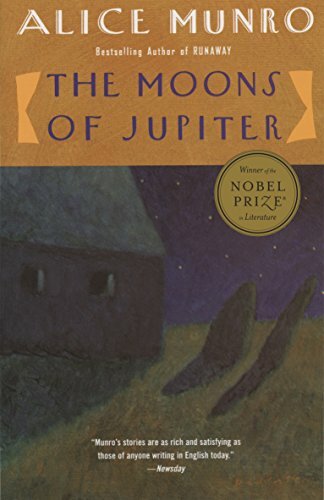 But the true events in The Moons Of Jupiter are the ways in which the characters are transformed over time, coming to view their past selves with an anger, regret, and infinite compassion that communicate themselves to us with electrifying force. In these piercingly lovely and endlessly surprising stories by one of the most acclaimed current practitioners of the art of fiction, many things happen: there are betrayals and reconciliations, love affairs consummated and mourned.